A message posted on eirigi’s Facebook page said that a number of men were seen to “systematically” target Drumm’s posters using long lengths of timber. 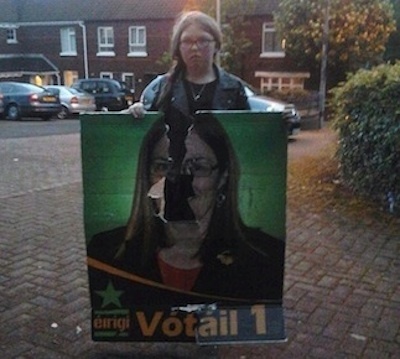 An independent republican council candidate in north Belfast has separately hit out at the PSNI after canvassers were arrested for putting up election posters in north Belfast. Independent republican candidate Dee Fennell said four members of his election team were held under “anti-terror” legislation on Wednesday as they erected posters on the Cliftonville Road. The Ardoyne man said all four were stopped and searched. His complaint comes after Davy Hyland, an independent election candidate in Newry, also accused the PSNI of political policing when 15 of his canvassers were detained during a similar operation. Sinn Fein has also complained that its posters have been removed across the North, in both unionist and nationalist areas, without saying who it believes was responsible. Meanwhile, the party has responded to criticism and voluntarily removed a new mural of Gerry Adams on the Falls Road in west Belfast, near Divis Street. The move comes just two weeks after the mural was erected as Mr Adams was being questioned about IRA activities by the PSNI earlier this month. The mural, which included Mr Adams’ face along with the words ‘Peacemaker, Leader, Visionary’, featured in international news coverage of his arrest. Rival republicans and historians strongly condemned the decision to erase the existing conflict-era mural of the Falls Road curfew featuring Maire Drumm, the mother of the eirigi election candidate of the same name. The Adams mural is now to be replaced by a new one supporting the campaign for an independent review into the killing of 11 civilians by the Parachute Regiment in the Ballymurphy area of west Belfast in 1971. Elsewhere, the party was blaming ‘dissidents’ in Omagh for paint thrown at a poster outside the party’s office in the County Tyrone town. “The despicable act by these culprits was made all the worse as they used the sanctity of church grounds to launch their attack,” said former local Sinn Fein MP Pat Doherty.